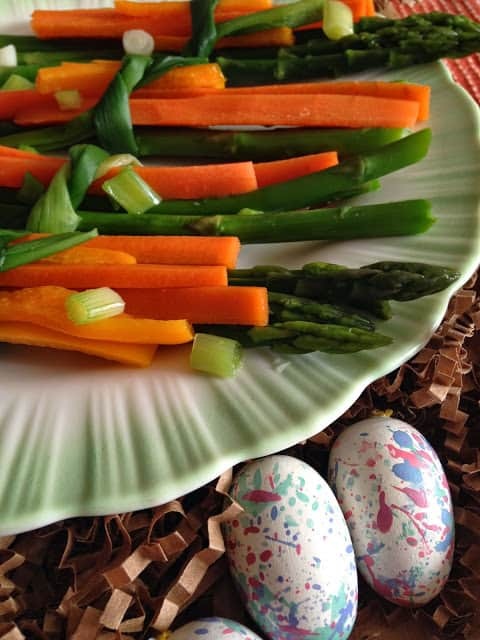 These vegetable bundles are perfect for Easter or anytime. You can assemble these bundles before your guests arrive, then cook them in a matter of minutes. Everyone gets their own bundle of vegetables. Trim both ends of onions; cut the green tops into 7-inch lengths. In a saucepan, bring 1 cup water to a boil. Add onion tops; boil for 1 minute or until softened. Drain and immediately place onion tops in ice water. Drain and pat dry. Chop white portion of onions and set aside. 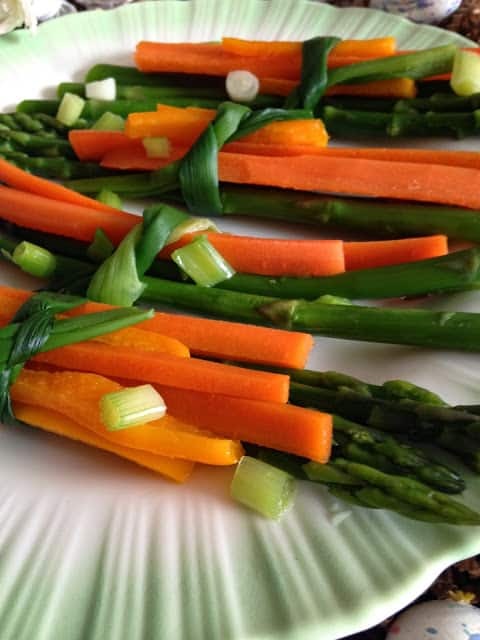 Divide asparagus, peppers, and carrots into 12 bundles. Tie each bundle with a blanched green onion top. In a large skillet, place chicken broth, white wine and chopped onion. Bring to boil. Add vegetable bundles. Cook, uncovered, for 5 to 7 minutes or until vegetables are tender and liquid is reduced by two-thirds. Carefully remove bundles with a slotted spoon to a serving plate. Add butter to skillet; cook and stir until melted. Spoon over bundles. *Use asparagus spears that are 1/4 inch in diameter, if larger than that, cut spears in half. Fresh Asparagus 101. Kitchen Tip~ To quickly thaw frozen spinach, place in colander; rinse with cool water until thawed. Drain well, squeeze dry with paper towels. There is always something special about individual portions. 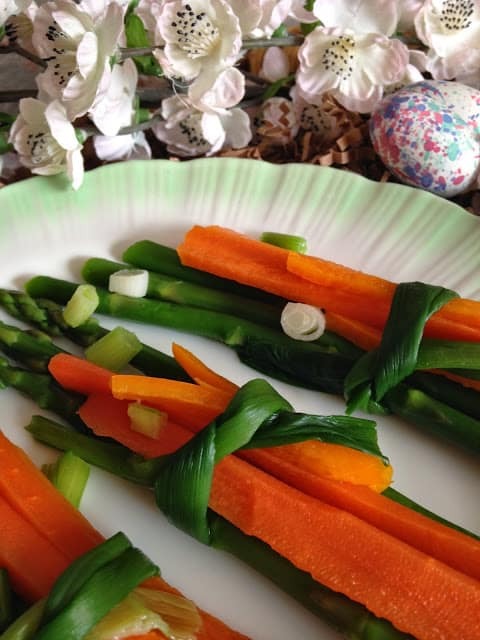 These vegetable bundles look elegant too and would be very pretty on a platter at Easter dinner. I also like that this is a light way to serve veggies (as opposed to our usual heavy, creamy casseroles). Thank you for sharing, Lynn. Thank you so much for joining in with the Say G'Day Saturday linky party! I've just shared this on Google+ and Pinterest. 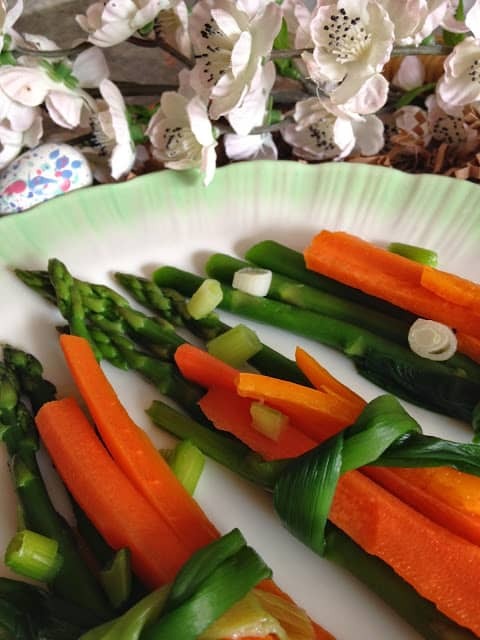 Good Afternoon Lynn, What a fabulous way to cook vegetables….. they look so colourful on the plate. I was thinking of using your technique for our Easter Dinner, as it will really enhance the look of my meal. Thank you for this useful idea. Hi Lynn, your this healthy vegetable bundle look very pretty. Great combination. Thanks for sharing.